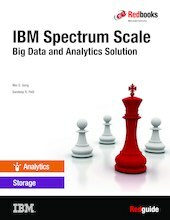 This IBM® Redguide™ publication describes big data and analytics deployments that are built on IBM Spectrum Scale™. IBM Spectrum Scale is a proven enterprise-level distributed file system that is a high-performance and cost-effective alternative to Hadoop Distributed File System (HDFS) for Hadoop analytics services. IBM Spectrum Scale includes NFS, SMB, and Object services and meets the performance that is required by many industry workloads, such as technical computing, big data, analytics, and content management. IBM Spectrum Scale provides world-class, web-based storage management with extreme scalability, flash accelerated performance, and automatic policy-based storage tiering from flash through disk to the cloud, which reduces storage costs up to 90% while improving security and management efficiency in cloud, big data, and analytics environments. This Redguide publication is intended for technical professionals (analytics consultants, technical support staff, IT Architects, and IT Specialists) who are responsible for providing Hadoop analytics services and are interested in learning about the benefits of the use of IBM Spectrum Scale as an alternative to HDFS.